There are several questions that you might have regarding Cryptopay ICO. Where can I find my ICO account / my CPAY tokens on Cryptopay? To check and manage your CPAY tokens you should add the ICO account to your profile. Go to the Accounts page and click on the plus sign to add a new wallet. How can I use my CPAY tokens? At the moment there are 2 options available. You can store CPAY tokens in your personal ETH wallet and receive your monthly rewards. Alternatively, you can use your tokens for trading on the exchange. Moreover, one of the ICO goals is creating a whole community around CPAY and Cryptopay. So, there is logic in adding more utility functions to the token in the future in order to integrate it into the service and implement new ways to use the token on Cryptopay. Should I withdraw tokens from Cryptopay ICo account? If you don’t withdraw tokens, the smart-contract is not activated. That means you won’t be able to receive your monthly revenue share. So, it is better to withdraw tokens to your personal ERC20 compatible ETH wallet. Thus you will be able to get revenue share or trade CPAY on exchanges if you want. Where should CPAY tokens be stored? CPAY tokens can be stored in any ERC20 token standard compatible ETH wallet. You can also check the compatibility here. 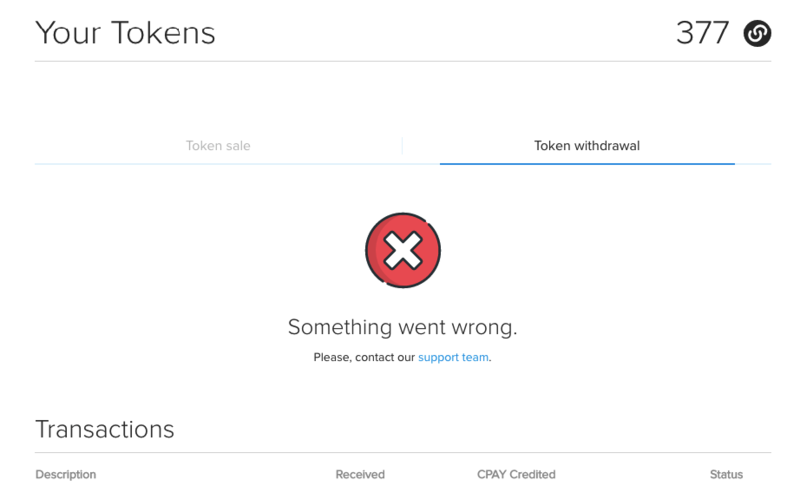 I tried to withdraw CPAY tokens from my ICO account, but something went wrong. If you see this error when you try to withdraw your tokens, please contact our Support Team. We will fix it, and your withdrawal transaction will be processed. I have withdrawn my tokens/my revenue share. Where can I find TX ID and other details of these transactions? All information regarding such transactions can be found on etherscan.io. You just need to enter your ETH address there. In the Token Transfers tab you can see all incoming and outgoing token transactions. In the Internal Transactions tab you can check that your monthly reward was sent to your ETH wallet. Where can I find a contract address? How much is CPAY Circulating Supply / Total Supply. Total supply is 90,414,745 CPAY. As for Circulating Supply, you can always check it on Coinmarketcap. Where can I buy CPAY tokens? Our ICO public sale was finished in October 2017. At the moment you can buy CPAY tokens on HitBTC. Do you have plans to list your tokens on other exchanges? Yes, we do have such plans. At the moment we are negotiating the listing terms with other exchanges. We’ll let you know once CPAY token is listed there. Do you have plans to add ERC20 token wallet on Cryptopay? Yes, we have a plan to add a wallet for ERC20 tokens in 4Q 2018.